Extra reinforcements are sewn throughout the cover to offer additional padding at sharp areas. A ladder cap is also included. This material is suitable for all environments, as it will offer great protection against rain, snow, intense sun, and other elements. The cover is breathable to prevent mildew and features vents so that air can escape in strong winds. The cover is made with a Tyvek roof to offer heavy duty protection where it is most needed. The white Tyvek roof panel also reflects sunlight, keeping the unit cooler. The cover features a strapping system at the front which allows you to secure any extra material. Tie downs are included with the cover. The tie downs feature weighted buckles which makes snapping buckles on each side of the cover easy. Each cover comes with 4 FREE Tyre Gards. ;A Free Storage Bag is also included. ADCO is North America's oldest protective cover company and they have been in business for over 55 years. Their Tyvek series cover has been redesigned to offer better protection against heavier weather conditions and wind. 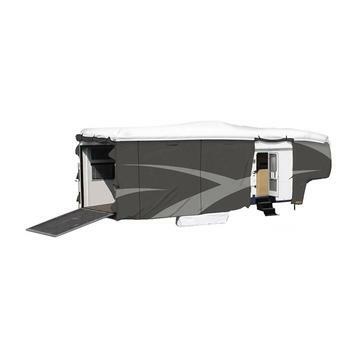 This cover features a Tyvek roof panel which is structured to offer your RV the strongest protection where it needs it the most, while keeping the unit cooler at the same time. The sides of this cover are made with a durable polypropylene fabric which protects the RV from wind, UV rays, rain and snow. Tyvek Plus Wind covers feature a 3 year warranty. Item is in-stock and ships same day. Want your order to ship today? Want your order to ship today? Order an in stock cover before 3 pm eastern time. The Customer Reviews shown reflect the RV style of the chosen product, as well as the material type. This customer submitted a rating only review. The provider service was great. *** The vendor worked with me to get it replaced quickly and easily. Excellent service, quick delivery, product is of high quality, fits our RV well. I would recommend RV Covers Direct to anyone looking for a RV Cover. Thank you! The order process was very simple and shipping was fast. I had the cover in 4 days.